I’m so excited, I picked up my wedding dress from alterations last week . As much as I’m overwhelmed with wedding planning right now, the day that we get married cannot come soon enough (that would be October 21st, by the way). I’m ready to be married! I wish I could show you the dress right now, I’m so in love with it. It’s vintage, I found it online, and it couldn’t be more perfect. I was very decisive about the dress but it’s time to start thinking about my wedding shoes. I want to find the find the perfect shoes to wear for the wedding but I want a stylish shoe that I could also wear for years to come. I fell in love with the Stuart Weitzman MOREPEARLS when I first saw them on Instagram…I now own them in both red and in white. The white MorePearls is part of Stuart Weitzman’s bridal collection and you can see it would make a stunning shoe for the big day! I love the view of this shoe from the back with the three dimensional pearl details. As a bride-to-be, I am in the mood for romantic white dresses. 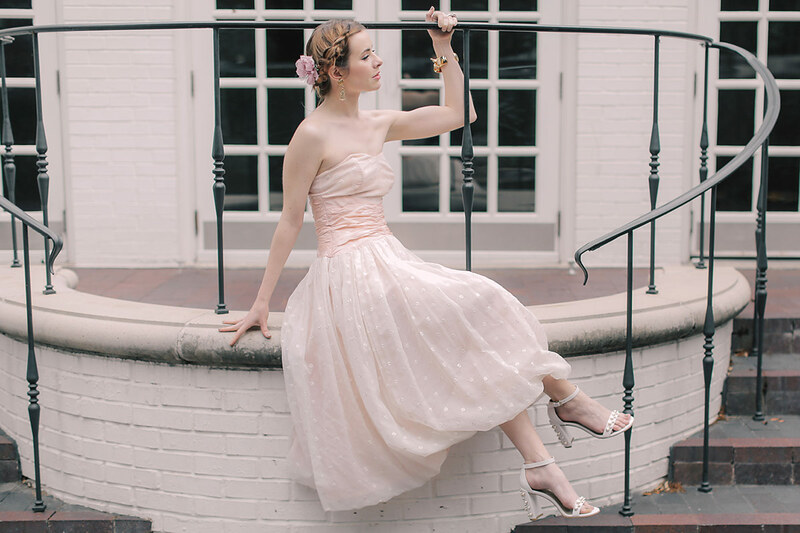 I’ve been considering this 50s strapless cocktail dress I’m wearing for the reception after the ceremony…it is such a dream come true with these shoes. I can’t wait to see your wedding dress! I’m sure it’s going to be amazing. Those shoes are gorgeous! They’re giving me ideas for my wedding shoes!! The blush tone to this look suits you perfectly. I’m a huge fan of vintage and can’t wait till we see your wedding photos. This 50’s dress is a favorite silhouette of mine , I love ❤️ the shoes and dress together , great styling ! Love love love it! Modern fairy princess! I would love a vintage wedding dress as well! Those shoes are definitely gorgeous! Jane, you will make such a stunning fall bride! Congratulations! And October is the best time to get married. :) That’s when I did too. Those shoes are so pretty. Cool how the pearls match the spots on the dress. Though I don’t get how you can wear a strapless dress without the fear of it falling down. Also, braided hairdo is amaze. Oh, I’m at the exact same stage! Looking at wedding dresses was easy, I’ve decided to design my own, and I knew pretty quickly what I wanted. But the shoes turned out to be really hard to find! Love the pearl details on these, and the heel looks comfortable enough. They look great with the light pink hue on the dress. 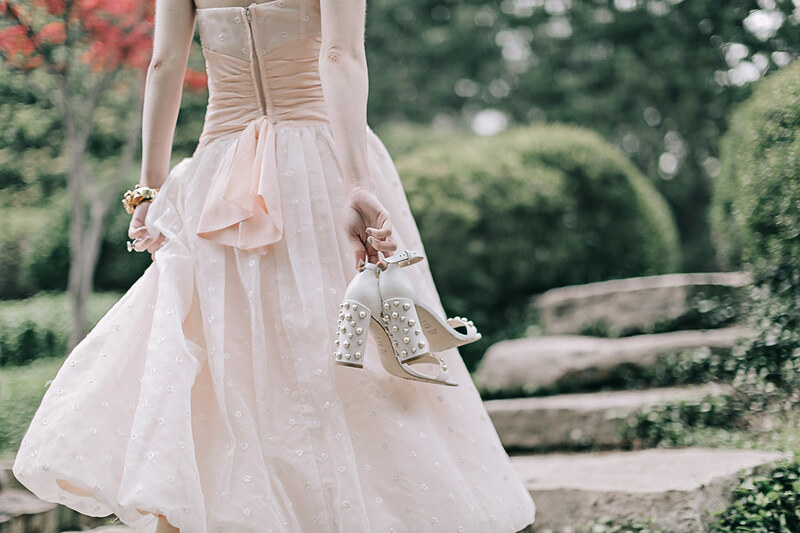 The shoes go perfectly with your dress. What a gorgeous look for a gorgeous girl! What a gorgeous choice for a day like this!!!! Awesome Look, Dress & Shoes is just gorgeous, Great colour combination. with all the beautiful shoes – did you ever Encounter Problems such as rubbing or Blisters? I wonder what you do to prevent them. For me, I’m having shoes I own and wear for years, but every summer, they still don’t fail to give me Blisters even though they are comfortable, well-Fitting (even had this issue checked by a Cobbler and an orthopede). Must be the heat related swelling and some sweating, that makes them rub even when they are broken in.